A few weeks ago the weather started to warm, the snow began to melt, and the birds began to sing. My wife and I decided it was time to go out for a hike. We packed our gear, got appropriately dress, and headed into the woods. The ground was wet and muddy. We walked down the trail and headed off of the beaten path. Snow glistened as the sun began to peak through the bare canopy above us. We weren’t the first to walk through the area. Footprints littered the side trails, and it was an odd discomfort that we weren’t completely alone out there. As the thought of walking away from the trails crossed our minds a random dog ran up to us, gave us a friendly tail wag, and ran back off to its owner. We knew we needed to walk farther into the woods. No more trails. Our feet sunk into the soft ground beneath the snow as we hiked farther from civilization. Our backs were weighed down with, what we feel, is some of the best gear we could find. Our shoulders were heavy with weight but light with comfort and security, knowing we were well taken care of in a worst case event. We had our food, water, cooking supplies, tent, tarp, and tools. Years ago, I decided to research the best ways to carry water. Any survivalist will tell you water is the most important resource you can carry. For thousands of years, man has developed interesting and unique ways of carrying water into, and out of, the wild. One of the oldest methods of carrying water has been an animal bladder or waterskin. Archaeologists have found records of waterskins from 3000 B.C.E. making this one of the oldest methods of carrying potable water. The Spanish, French, and Italians used that technology to make the ‘Bota De Vino’ to hold wine. It’s basically a leather bag meant to store and carry wine. As technology advanced new materials became available, and as the need for potable water changed so did the device used to carry it. More recently, different materials like metal, glass, and plastic have allowed humans to carry water farther, longer, and with more safety. Water, at the beginning of the 1800s and into the 1900s, were transported in various methods to their destinations. Even ice boxes used this new technology to carry and store ice to be used later. World War 1 and 2 set a new need to quickly carry water for personal use. The wars caused great destruction to water sources through decaying animals, biological weapons, and stagnant water from artillery fire. Water was not safe to drink from most sources, even if that source provided safe water in the past. While empty gourds were used as canteens for millennia they were not used to the types of abuse and hostile environments as the soldiers, fighting in the wars, needed. The invention of the metal canteen was used extensively by soldiers during both wars and became standard issue to most soldiers across the world, during WWI. Aluminum, Steel, Copper, Tin, Glass. All of these were materials used by soldiers to transport water for themselves. The one thing, none of these materials afforded, was space. The amount of space used, when empty or full, is always the same. On top of space requirements, most of these methods and materials are very heavy. The newest form of carrying water comes from plastic. While plastic has multitudes of problems ranging from the use of fossil fuels, the ability to poison the water, and the relative fragile construction it has proven itself to be one of the most efficient ways to carry water, or any liquid, in this modern age. Hospitals use plastic to carry medicines, test samples, and blood. Grocery stores now have shelves packed with plastic jugs full of water. Walk into any gym and you’ll see someone, maybe everyone, drinking from a plastic bottle. Plastics have several unique characteristics that make it a viable product for carrying water. The weight of plastic is relatively low. Plastics can be made very thin or extremely thick for durability. Many plastics are flexible while others can be made to be extremely rigid. Some types of plastics even expand with pressure while others can mimic the qualities of a metal canteen. I weighed the pros and cons of every type of water container. In my mind, I wanted to carry more gear and be able to use whatever water I found. Taking the history of WW1 and WW2 into account, that is not always a possibility. Even in today’s modern age we still find water sources plagued with a disease which can and will, cause serious harm or death to anyone who drinks it. Regardless, of disease, I was drawn to a plastic hydration bladder. When I first looked into this possibility they were still relatively new and used primarily by serious athletes. The cost was the most prohibitive but what drew me to hydration bladders the most was the ability to save room when hiking. At the time, the cost was too high to even consider a hydration bladder. As I looked for some way to carry water I stumbled across Geigerrig. I had been in the market for a new pack for some time. What drew me to them the most was the hydration bladder that came with all Geigerrig packs. Their technology was new and revolutionary, at the time, and while I didn’t look too closely I thought it was a great product with a decent price, so I bought the Geigerrig 1600 when it was on sale. I still remember the day it had arrived. When I opened the box I thought it looked like any other backpack, until I saw the bladder. I was excited but at the time I failed to read the full description. I had bought this pack on an impulse and was so glad I had. Failure to read everything at the time meant there was a discovery to be made! You see, Geigerrig packs are made to be extremely durable. The 1600 I had bought was made of a very strong 1680 Ballistic Rip Stop Nylon. It had little loops, pockets, and zippers all over the place. They have a resilient warranty on manufacturer’s defects in every backpack they offer. I decided to forego the every-day use of the hydration bladder and used the backpack to carry my computer back and forth to work for quite a while. Essentially, I used this great piece of hardware as a backpack alone. Having used it for quite some time, it started to show age. I had clipped a radio to the strap and watched it fall to the ground. The stitching had failed and while the backpack was damaged, luckily, my radio was not. A frantically searching google for answers I stumbled across their warranty. Within the day I had filled out a warranty form and was eagerly waiting to hear back. About 2 days later I heard back from Geigerrig. The pack would be covered under warranty. Better yet, I spoke to them about upgrading to the relatively new Geigerrig 1600 Tactical. Not only was I extremely surprised at their professional tone and customer service, they were eager to make sure I had a product that I could use for a long time. And so, with that, I handed over my credit card information and set the clock. I was ready to get a new pack. While awaiting my new delivery I researched and played with the hydration bladder. I knew it was pressurized but I never paid much attention to why that was important. I took the 3L bladder out of my Geigerrig 1600 and filled it with water. No zippers or multiple folds, just a quick removal of the plastic piece and it was ready to fill. Hooking it back up to the backpack I had a difficult time telling which end should attach to the mouthpiece and which should attach to the pressure pump. After a few failed attempts the pack was ready to use. The pressure pump is just like a blood pressure cuff. It pushes air into a separate, but attached, the section of the hydration bladder. As it fills up with air it removes space that the water can be stored. With a small squeeze of the mouthpiece, the bladder started to spray water all over. They call this pressurized system The Engine. All of their bladders are made by Aquamira, which recently merged with Geigerrig. All of their bladders are extremely flexible, lightweight, BPA-Free, and dishwasher safe. Yes, dishwasher safe. As lazy as I am, I had never thought about putting a hydration bladder in the dishwasher; now, I don’t think I can ever go back. Aquamira offers a warranty of their own. They provide a lifetime warranty on any leaks. This was a warranty I was sure to test the limits of. The new Geigerrig 1600 Tactical had arrived, and with it came my order for the 700 Tactical. There are some big differences between the two, which I’ll get into, but are very similar packs. The 1600T had some much-needed improvement over its predecessor. Not only did Geigerrig increase the zipper opening to the main pack, add MOLLE straps, and insulate the drink tube they added two bedroll/tent straps on the bottom and a cover for the engine pump. The issues I had with the old 1600 were simple. The pack itself was strong and durable but very limited. IT was made of the everyday commuter. There was an obsolete iPod pocket with a headphone jack, over-sized laptop pouch, and severely limited main compartment with a very small zippered opening. While it could be cinched closed with the side straps it was hardly ever needed. One of the best features is the removable waist strap with additional storage. 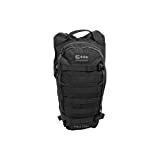 Despite its large size it still can be small for someone needing a survival or bug out bag. The New 1600T solved a lot of my previous issues with its predecessor. It removed the silly iPod compartment affording more room to the secondary compartment. The zippered opening to the main compartment was extended, however, they removed the laptop pocket. The side straps were the same and extended slightly at the start of the main compartment zipper, helping to keep the pack closed. One major upgrade was the addition of a thick plastic, almost ballistic, a barrier between the user and the hydration bladder compartment. In what seems like an effort to easily allow expansion, Geigerrig integrated MOLLE straps to not only the backpack but also the waist strap. They strengthened it with 500D Cordura construction weighing in at 3.2 lbs, a slight drop from the 3.4 lbs of the original. Each of the packs comes standard with a 3 L bladder and, as the name implies, 1600 cu in of storage. Quick release bottom bedroll straps. Removeable, load bearing waist belt with Molle hip webbing. The 700T is the baby brother of the 1600T. It is not the smallest pack they offer but it certainly does sacrifice a lot of space. It weighs 2.05lbs, over a pound lighter than its big brother. Coming standard with a 2L bladder (but 3 L compatible) and with 700 cu in of storage. The 500D Cordura Nylon Construction makes it a strong contender for a perfect day pack. For the hunter, backyard woodsman, day hiker, or used in a car as an emergency this pack is perfect. Don’t expect it to carry all your supplies but it certainly will carry the bare necessities. The similarities between the 700T and 1600T end at the overall look and bladder compatibility. This pack is really meant for a light traveler. 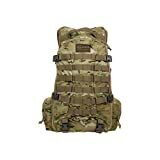 The MOLLE straps do allow for expansion but the overlay pack straps completely obscure the ability to multi carry. Carrying a tent, bedroll, or even walking stick while attaching MOLLE pockets will be a challenge. This pack is not made for multiple adventures and seemed a little lack-luster after having experienced the 1600T. That said, it’s one of the best made day packs I have ever come across. The warranty, hydration bladder, and compatibility to expand have really made a big impression. 500D Cordura fabric with molle webbing and compression straps. Internal guardian pack frame. Removeable waist strap with insulated drink tube and bite valve cover. After finding and transporting water there needs to be a way to filter the water. Unfiltered water can cause disease, infection, and digestive problems. Geigerrig and Aquamira have several products that filter and preserve the water that goes into the bladders. Geigerrig produces a Crypto filter, Virus Filter, and Water Treatment product. The two separate filters have the unique ability to be used with the bladder, used with other bladders, or stand alone. Their water treatment products offer safety without compromising flavor. Geigerrig generously provided me the water treatment drops and their Frontier Max Filtration System. Right off the bat, I have to tell you that I was very impressed with their filtration system. It quickly attached to the bladder, fit snuggly inside the pack, and offered no resistance of water delivery. The pack stayed pressurized even with the filter attached. The water purification drops are meant to clean the water, or bag, without leaving a bitter flavor, like tablets can. I can verify that this statement is true. The purification did not alter the taste of the water any more than the plastic of the bladder alters the taste of the water. And so, as my wife asked me where the water was a quick smile crossed my face. I knew she wasn’t expecting to have to find water in the wild. Luckily, we were so close to a river and the snow melt provided a lot of run-offs. We walked for a short time to find the dirtiest water we could. Not stagnant, just dirty. Walking upstream I found where the water made a little island. The streams joined to the front of the island and turned the water, pulling up dirt, mud, and foam from the bottom of the small river. This was it. We pulled the bladder out of the 700T and got it ready. I walked into the shallow end of the river, opened the bladder, and let it fill with water while my mind second guessed how safe this was. Sure, snow runoff was fine, clean, and safe but this was an unknown. I dumped the water out while wondering if I should move farther upstream. It was too late, I already committed. I would find out if this filter worked as it should. I walked back to shore and prepared the water purification drops. So many drops of Part A and an equal mixture of Part B. It basically was a Phosphoric Acid drop that went directly into the water. As it went into the water my wife grabbed up the camera and snapped a few pictures, amazed I was going to drink that water. The tubes were reattached and the bladder was shoved back into the pack. After 20 pumps of the engine, I tested the stream of the water. Perfect stream. I offered a drink to my wife first, who promptly refused. She scrunched her face and shook her head vigorously. It was up to me. I drank, and drank, and drank. Yes, it tasted a bit like plastic but it did not taste like a purification tablet. I realized that this engine, this pressure, was perfect for multiple people. Not only did I have enough water for myself but could easily offer it to my wife, or others, without the risk of contaminating a drinking valve. I had consumed roughly 3 oz of water. There was no going back to the way it was before. If I was going to be sick I had placed my trust in the wrong device. If I was healthy I would be able to write about the entire experience. And so, two weeks later, I am here writing the entire experience, proud to have used Geigerrig. As amazing as Geigerrig packs and Aquamira bladders and filters are there are some serious drawbacks to completely replacing your canteen, current bladder, or bug out bag with their products. What I found to be the most difficult, and frustrating, thing about their bladders is that they expend so much. If I had completely packed everything I needed, and tried to add water after I was already packed, there would be no way to fit everything. In addition, when I filled the 2 L bladder and put it into the 700T it took up nearly all the space in the main compartment. The only thing stored in the main compartment was out compact tarp which we had to remove just to use the bladder. This also meant that anything fragile would easily be crushed. Which it might be a great way to tenderize a steak it’s not a great way to store all your goods. Even with the 1600T I get nervous thinking about how much pressure my mess kit can really handle before it gets crushed. Or, better yet, how my sunglasses will look when I take them out. Even the thought of carrying an iPad or eReader was enough to make me leave them at home when I use a Geigerrig. We filled up the 2 L and pressurized it on the shore, too. It was wider than my Gerber Multi-tool is wide. While I’m sure that this can easily be overcome it’s something to consider when purchasing a multi-use pack. I am an avid martial artist. When I read Aquamira’s warranty I tried to think of every way to break the bladder. While I’m not going to D.B. Cooper the engine I did want to put some pressure on their assurances. And with my imagination running wild I took the pack, and bladder, to the gym. As I entered the gym and attached the 700T to a kicking pad a quiet fell over the room. Eyes were on me and what in the world I was doing. I attached it firmly, pressurized the engine, and took a step back. If this didn’t work I would have a lot of cleaning up to do. My knee ached with anticipation and my foot was ready to move. I turned my hip, my left foot stayed firmly planted, as it spun, on the ground. My right knee went up and my shoulder dropped. I kept my eyes on the Geigerrig logo as my right foot popped away from my thigh and my leg extended. Contact! I closed my eyes for a quick second, worried it would spray water everywhere. As I opened them the 700T was still there… dry. So, with that, I asked my friend to try. He wound his leg around his body and made contact with a deep, ‘thump.’ Still dry. We opened the bag and removed the bladder. It obviously had stretched, as any plastic would, but was not damaged as badly as we thought it would. It held up two two blackbelts, kicking as hard as they could to ensure failure. Overall, Aquamira’s bladder was a success, not a failure. Geigerrig has made, at least two, outstanding packs. Their 700T and 1600T are a viable option for individuals who need a pack that can do more than just carry dry gear. The company has improved upon its former success and released a product line that puts any other competition to shame. They seem to have listened to the issues and difficulties that users have had and responded with a better product. While I am not thrilled at the amount of space the bladder steals from the pack it is a useful tool at a user’s disposal. It remains a heavy alternative to a stand-alone, lightweight pack and separate bladder. Geigerrig is basically a multi-tool backpack. Any multi-tool is not a perfect tool. A multi-tool will never completely replace the need for a wrench, or a screwdriver, or even a knife. While it can be substituted for those items, in certain circumstances, it does not entirely replace them. Geigerrig is a multi-tool but one that can replace alternatives. The bladder will easily outperform alternative bladder systems. The pack can easily outperform other packs in durability tests. Where the issue lies, with Geigerrig, is using both at the same time. One needs to make a sacrifice for the other to work as efficiently as possible. While sacrifices need to be made with a lot of gear these are two pieces of gear that should not accept any sacrifices in functionality and dependability. The only part of the Geigerrig multi-tool that does not compromise is the filtration system. It picks up where LifeStraw leaves us. It is designed to be used with multiple hydration systems, not just Aquamira, and even by itself. It meets, or exceeds, ANSI/NSF 53 and 42 for pathogens and chlorine. When it comes to water storage and filtration Aquamira is setting the bar very high. The 700T and 1600T are both great, tactical packs that will serve a variety of functions. However, it is doubtful these packs will be for everyone. The weight and tight space may eliminate its consideration, for many users. Regardless, if is one heck of a system that can be put to use right away as a wonderful 72 hour, or day pack. This pack is great at making a user think about what is really necessary and what is really a luxury. Jonathan Kilburn is a Martial Arts Instructor, Special Needs educator and businessman. He focuses on self-reliance and survival in difficult urban and sub-urban areas. Natural disasters have pushed Jonathan to teach about urban farming, homesteading, and survival. As a Special Needs Educator, Mr. Kilburn has developed a neurological approach to executive function. This means: pushing the boundaries of human needs vs human wants. This mindset and philosophy assists in training himself and others in self-reliance and survival. Mr. Kilburn has also studies martial arts which include but are not limited to: Aikido, Combat Sambo, Judo, TaeKwon-Do, Haidon Gumdo, and various other sword arts. MultiWallet Desert Eagle Edition. Kydex Tactical Wallet With Money Clip and Multitool.